Mariana Gosnell's Ice (see chapter 1) provides an engaging narrative on the subtleties and quirks of lake ice. References cited below provide more scientific detail on freshwater ice. Gray and Male's (1981) Handbook of Snow gives an expansive discussion into many aspects of seasonal snow that are not possible to discuss here, with a focus on snow hydrology. Kenneth Libbrecht offers insights and a remarkable collection of photographs capturing the wonder and intricacies of snow crystals, with a repertoire of texts that range from children's books to advanced physics. Gray, D.M., and D.H. Male, eds. (1981). Handbook of Snow: Principles, Processes, Management and Use. Pergamon Press, Toronto, Canada, 776 pp. Libbrecht, K.G. (2003). The Snowflake: Winter's Secret Beauty. Voyageur Press, Stillwater, ME. Libbrecht, K.G. (2005). 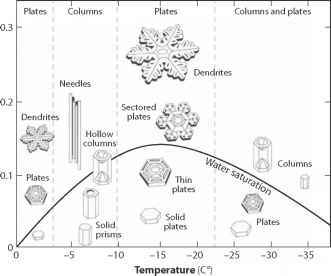 The physics of snow crystals. Reports on Progress in Physics, 68 (4), 855-895.